Do you need a gooseneck or a bumper pull horse trailer? Home / Resources / Buying Custom Horse Trailers / Do you need a gooseneck or a bumper pull horse trailer? Not Quite Sure of Your Horse Trailer Needs? Some people know exactly what they want in life, from their career path to their ideal horse trailer. Others struggle with deciding which socks to wear on any given day. Here at Double D, we appreciate that all of our customers are different. Some know exactly what they want in a horse trailer, down to the very last detail. Others aren’t so sure and prefer some help and guidance. In anticipation of these differing decision-making styles, we’ve covered the bases for you. 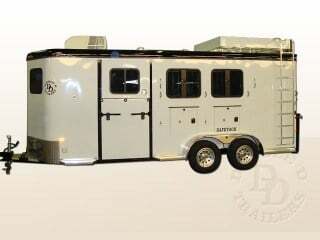 Simply visit our Web site and check out our horse trailer inventory. There you can learn about our various horse trailer models and view the trailers currently for sale. We’ve designed our site especially for you. 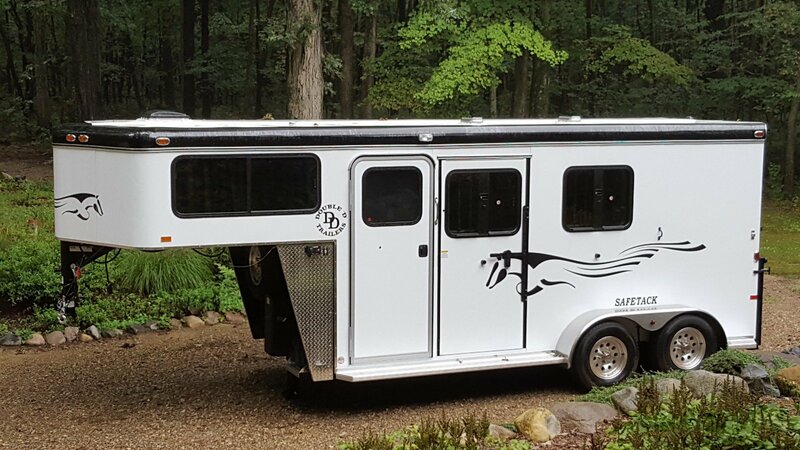 When you decide to Design Your Horse Trailer, you will be able to drill down through the various makes, models and options in a manner that just makes sense. Once you're done designing your trailer, or even if you're only partially finished, you can send your order to our team and we'll help you take it the rest of the way. Sounds like fun, huh? If only all the decisions you had to make in life were so easily mapped out! But that’s what we’re here for, to make your horse trailer shopping experience a pleasure. And as always, if you have questions, feel free to email us at sales@doubledtrailers.com or call 888-244-2029. Sleeping Quarters – Gooseneck horse trailers can easily include a large mattress in the gooseneck portion of the trailer. This can be a great feature to have if you plan to spend long days at the show or plan to camp out with your horses. Bumper pull horse trailers can have spacious dressing rooms, but the sleeping area is more limited. Tow Vehicle – Do you own or are you willing to purchase a pick-up truck? Gooseneck trailers often require a truck with a higher towing capacity and a pick-up bed for the hitch mount. Bumper pull trailers can be better if you have a smaller tow vehicle or fewer horses. Number of Horses – If you are only planning on towing one or two horses, then a bumper pull horse trailer may be perfect for you to hitch up and go. If more horses make you merrier, then a gooseneck may be a better option. SafeTack Configuration – Our patented SafeTack design with forward or rear facing options is available on BOTH gooseneck and bumper pull models. So no worries there!